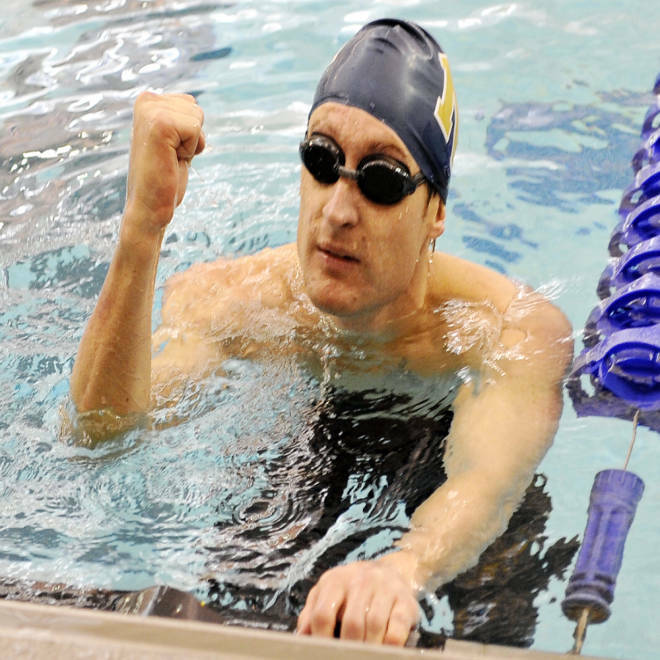 Less than a year after losing his eyes in a battlefield explosion, Navy Lt. Brad Snyder on Friday felt the wall, heard the cheers and tasted gold, beating the world’s best blind swimmers in the 100-meter freestyle final at the London Paralympics. In a race only the Aquatics Centre spectators (and none of the eight competitors) could see, Snyder, a former Naval Academy swimmer and an ex-Navy bomb defuser, posted a winning time of 57.43 seconds. He finished more than one second faster than China’s Bozun Yang, who took silver. “It was my first final, it was my first medal," Snyder said after the race. "It’s an immense amount of relief. There was a lot of uncertainty this morning as to whether I’d be fast or not, a lot of uncertainty whether I’d be able to come in front of this crowd and keep my wits about me and keep a good race plan. We succeeded on both counts today, came out of the gates with a gold medal and now I’m looking forward to maintaining that as much as possible throughout the week." Before today’s races, Snyder said his busy London swim schedule shapes up perfectly for potential success. During a patrol last Sept. 7 in Afghanistan, Snyder was rushing forward to help two Afghan soldiers wounded in an initial IED blast. While sprinting, Snyder tripped a second hidden bomb in a farm-field irrigation ditch. His eyes were irreparably damaged by the detonation and later were removed by a surgeon. Entering the London Paralympics, Snyder trained for months with his coach, Brian Loeffler, to shave split seconds off the world No. 1 times he already had set this year in three freestyle events — the 50 meters, 100 meters and 400 meters. But trying to cut through the water more quickly caused Snyder to crash hard into the lane lines during some of those practice sessions. Lt. Brad Snyder, blinded by an IED explosion in Afghanistan, trained hard for the London 2012 Paralympics. “I started wearing compression sleeves in practice because I started beating my arms up pretty bad,” Snyder said before Friday’s race. “We’ve put a lot of emphasis on quality. I’ve put a lot of work into just being as symmetrical as possible and really working on a quality stroke and trying to find ways to maintain good technique ... That way we can avoid crashing and losing speed due to fatigue. Centra "Ce-Ce" Mazyck, who was paralyzed during a parachute jump with the 82 Airborne in November 2003, will compete in the javelin at the London Paralympics. "This is my second chance," she tells NBC News' Jamieson Lesko. Like all blind Paralympic swimmers, Snyder competes while wearing blacked-out goggles — a Paralympic rule to ensure no athlete in the field can see even a glimmer of light. He also relies on Loeffler, the swimming coach at Loyola University, to stand at the end of his lanes and tap him on the shoulders with a walking cane to alert him that a flip turn or finishing kick is needed. The 100-meter free was the first of seven events Snyder will swim in London. Depending how well Snyder performs in his preliminary heats, he could race 14 times in nine days. “It’s spread across so many days. And there’s one event per day. And my coach and I have strategy on that: it behooves me to use the opportunities to race just to get accustomed to the pool, the setup, the sound of the start, and walking around," Snyder said. “If I can make finals in an off event then it gives me the opportunity to go through the ready-room system.